It's always nice to find a new use for an old picture. 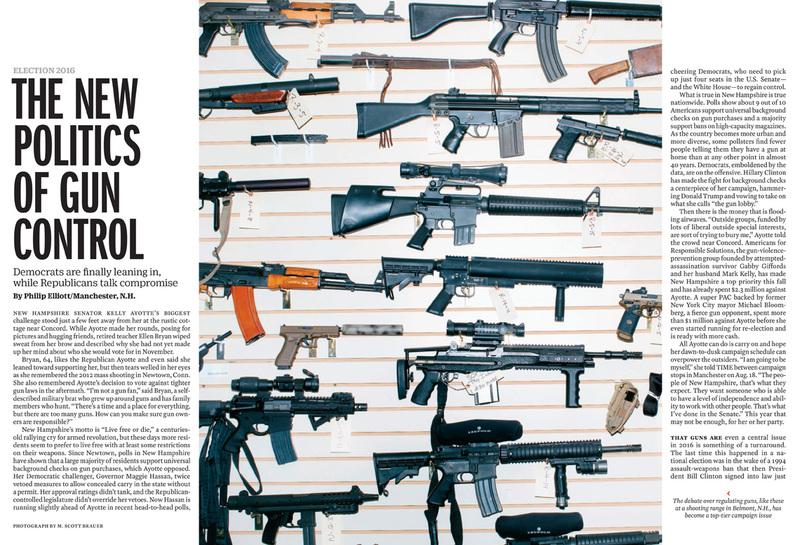 In this case, Chelsea from Time needed images of guns for a feature called "The New Politics of Gun Control" (← paywalled). I had some images from a gun range that I photographed during the 2016 New Hampshire presidential primary earlier this year, and it ended up as an almost double-truck in the Sept. 12-19, 2016, issue of Time. I had a funny way of first seeing the image in print: I was getting on a plane in Zagreb, Croatia, after participating in the Organ Vida Festival, and had been bumped to first class for some reason. The flight attendant asked if I wanted any newspapers, but only had Croatian newspapers. I asked if there were any English-language publications and she disappeared to check. She came back with the International New York Times and a copy of Time magazine containing this story and my picture. I'm not sure I've ever been handed a copy of one of my own pictures quite like that. Thanks to Chelsea and Croatia Airlines!